I remember hearing buzz about Kitchen Confidential, Anthony Bourdain’s account of what it’s like to work in a restaurant kitchen, shortly after it was published in the summer of 2000. Interviews and reviews that surfaced in the media piqued my interest, but I never got around to reading it at the time. Since then Bourdain’s fame has grown due to his participation in several television series, most notably No Reservations and Parts Unknown. Finally, last week, my husband checked out the eBook edition from Lincoln City Libraries’ OverDrive collection. He laughed so hard he cried as he consumed it nightly before bed, interrupting my reading to share excerpts so frequently that I felt compelled to check out, download, and listen to the audiobook edition, read by Bourdain, himself. 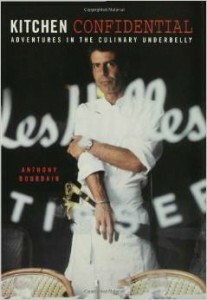 Early in the book Bourdain describes the life lived by restaurant kitchen workers as a subculture. From his anecdotes, which my husband swears aren’t exaggerations (he cooked for two years while I attended library school), that sounds spot on. This is not a ponderous or philosophical book, though Bourdain does share interesting insights and opinions. The prose is raw, in-your-face, and eloquently crude. As Bourdain reads his own words one imagines this is just the way he speaks in real life, when not restrained by television censors. If profanity bothers you, this is not the book for you! By the end of the book any illusions the reader might have had that cooking for a living is glamorous will have been completely shattered. Bourdain paints a picture of a physically and psychically hard life, where drug addiction and dysfunction reign. Kitchen crews are described at various times as pirate crews and mercenaries. It wouldn’t be the life for me, but I enjoyed reading about it! Great book, I enjoy reading it!! Recommended! !